One of the very few cocktails made with Scotch, the Blood & Sand makes a great cocktail and with a bit more OJ, can serve as a special addition to your brunch menu as well. The Blood and Sand, considered the quintessential scotch cocktail, was created in London in the 1920s and named for the 1922 movie Blood and Sand starring Rudolph Valentino. The recipe first appeared in print in the 1930 Savoy Cocktail Book so it definitely has a long history. 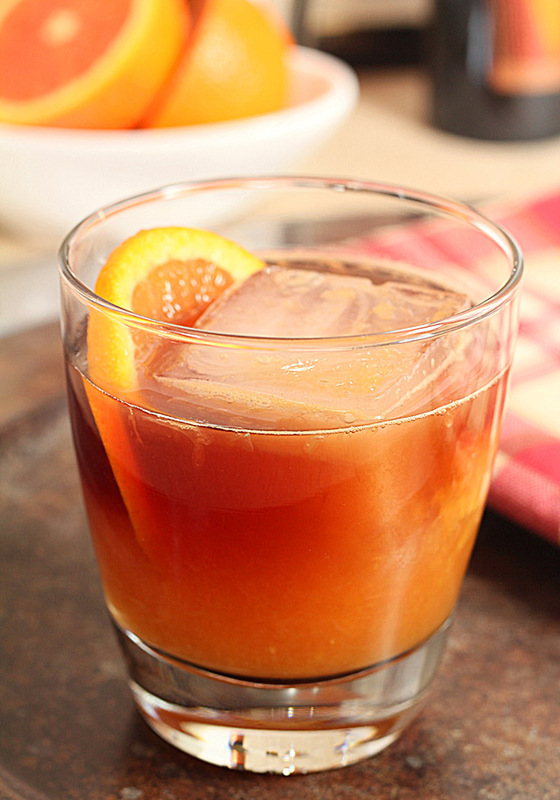 It combines scotch, Cherry Heering, vermouth, and orange juice for a smoky-sweet effect. Some historical data suggests that it was the red juice from a blood orange that helped link it to the film but few recipes specifically call for blood oranges so I’m not buying that anymore than I am the story of a hotel that claimed 20 years later that it was their invention! After making them, I have to wonder if the vivid red of the Cherry Heering liqueur combined with the tan/gold color of the Scotch didn’t have more to do with it. Speaking of blood oranges; they have not been so prolific this year and I miss them. Still, when I saw a large bag of Cara Cara oranges at Costco (whoo hoo…less than a buck a pound) I knew that they shared some of the elements that make blood oranges so desired yet I don’t recall I had experienced them before. 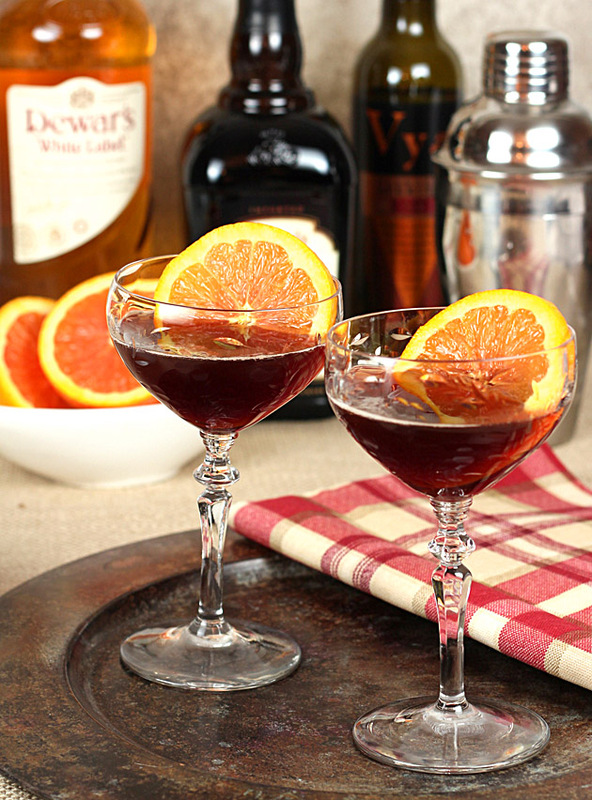 Wow…not that I will abandon my love for blood oranges but these are also amazing. A brighter pinker/peach color and definitely sweeter than regular navel oranges, I juiced a dozen of them and I honestly think I could have downed that entire pitcher…SO good. Find some for yourself stat! When I was asked by the folks with Dewar’s if I would like to try their Scotch; I was a bit perplexed. I’ve always thought of Scotch as a man’s drink I’ll admit…with only three cocktails that it works with. Straight up, on the rocks or with a touch of soda. Something about Scotch leads us to think men, clubs and cigars doesn’t it? So I had to do some research because I thought a post deserved more than just: 1. Fill a glass with ice. 2. Pour some Scotch over it. I’m not alone apparently, as the Blood and Sand is widely recognized as one of the few cocktails that includes Scotch in the mix. Dewar’s, now owned by Bacardi, has a long history, first arriving in the United States in 1891 when Andrew Carnegie sent a small cask to then-president Benjamin Harrison. 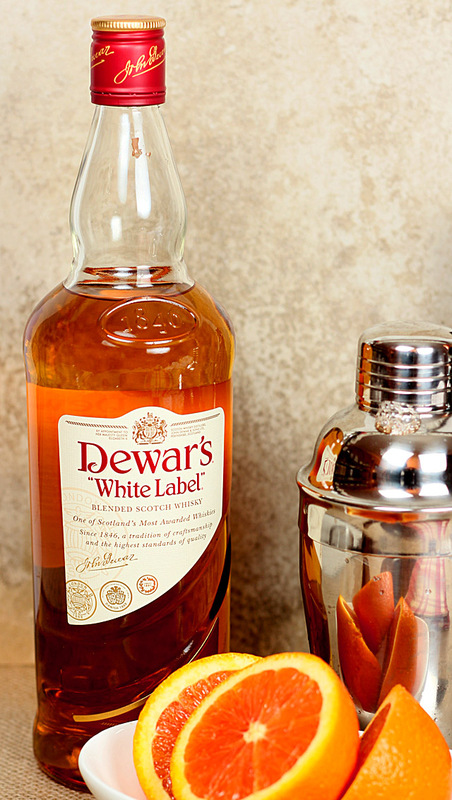 Before starting his own blended Scotch brand, John Dewar sold wine and whiskey in Scotland; their Dewar’s White Label has proven to be the company’s most popular blended Scotch Whiskey over the past 100 years; it’s venerable sure but the company is reaching out and trying to change perception; witness the ads appearing lately with Claire Forlani as a Scottish temptress! This cocktail is a kick…with the cherry liqueur and orange juice making a nice foil to the strength of the Scotch and I actually liked it very much. It is definitely what I would describe as a ‘big girl drink’ – not one for those who would normally prefer my S’More’s Martini! When I first decided to make this cocktail, I sort of ignored that my bar book called for Cherry Heering liqueur. I knew I had a Kirschwasser (Kirsch) in my liquor cabinet but when I started to dig further into the ingredients and history, I found one thing repeated over and over. Do not substitute a cherry brandy like Kirsch for the Cherry Heering. Great; my plans were completely dashed. Still, I found the Cheery Heering and am sort of glad it worked out that I had to use it; I love this liqueur. Since 1818 Cherry Heering has been made only with natural ingredients, including elderberry extract and Danish grown cherries and have no artificial flavor or colors. It’s a is a ruby-red liqueur made by soaking lightly crushed Danish cherries and a blend of spices in neutral grain spirits, then cask-maturing the mixture for up to five years, adding sugar during the aging process. It tastes very similar to the syrup of brandied cherries; so what’s not to love? I have Luxardo Maraschino liqueur in my stock but found that the two are very different. The Luxardo (32% abv; 64 proof) is higher in alcohol than Cherry Heering (24% abv; 48 proof), so it’s not as sweet or as viscous. The sweetness of Cherry Heering is an ingredient that adds a great cherry flavor but also serves to temper the strength of the other ingredients. Comparing Cherry Heering to Kirsch? Don’t make the same mistake I almost did. Kirsch is an unaged, unsweetened eau de vie made by distilling fermented cherries and the result is a clear liquid. It would be wrong, just wrong! Now that I have it in my bar; you’ll see more soon; did I say I love this liqueur? During my information gathering, I noticed one suggestion that this could also qualify as a brunch cocktail if poured over rocks in a highball glass and topped with some additional orange juice and I’ve found that version to actually be my preference. I love how the ingredients remained separated and beautiful when I topped the finished product with some Cara Cara orange juice; tell me that those layers don’t say it all…Blood and Sand. The traditional cocktail has less OJ and is more typically served in a coupe; try both and see which you prefer but truth is I think both of these cocktails are divine. Hope you think so too! A classic cocktail; one of the few using Scotch as an ingredient. Combine scotch, Cherry Heering, vermouth, and orange juice in a cocktail shaker filled with ice; cover and shake until chilled, about 15 seconds. Strain into a chilled coupe glass and garnish. Prepare as indicated but pour over ice in a rocks glass and top with additional orange juice. I was provided with a sample bottle of Dewar’s White Label however all commentary is my own. I love doing the cocktails; although the one I did today for tomorrow had me pulling my hair out. Pomegranate arils are not always cooperative! You certainly do compile a lot of information for all your cocktail posts. They are wonderful and educational. Enjoyed reading this one very much and really love the colour of this cocktail. I love sharing the history of our more ‘classic’ cocktails; seems they all have one doesn’t it? It was beautiful Paula and so tasty too! Isn’t it though? It was so beautiful…I’m seriously glad I was forced to buy the Cherry Heering; it’s a gorgeous burgundy color and I’m sure will be making an appearance soon all by itself. you always have such great cocktail ideas on your blog! mmm i want one of these now! My sister is the mixologist in our family so I always sort of depend on her for a good stiff drink…but I may need to try my hand at it soon with this. Thanks much Sheila…I suggest you try your hand at one and surprise your sis. My friend did that with her husband and now he begs her to make new cocktails! I LOVE this. Normally I drink my scotch neat. We have a whole collections of Islay and Highland single malts so we never *ever* use them for mixed drinks. However…. I couldn’t pass this one up. I used a Clynelish with the Heering (completely out of blended scotch…. )… so fabulous… This drink will be my go-to for a while. YAY! So glad you enjoyed them too…especially coming from someone who sounds like a Scotch connoisseur. They are not for everyone and I’m not knocking down the ‘boys club’ with my bra in hand but there are a nice change from straight up over ice! Your first photo may rival your cranberry ginger fizz photograph– simply gorgeous! I always appreciate the detail and history of your cocktails that you share with us all. I look forward to seeing what you post each Friday! Aw thanks you! It was a hard one. REALLY wanted to use the tray but it’s not exactly level and I just said ‘the heck with it’ and did it anyhow. This is real world food photography, not perfect at all! BTW, had your mararons last night; I thought they were the best ever. Maybe I just like a higher proportion of filling to meringue? Doesn’t hurt that they are so dang cute! I was hesitant about this because it is not normal to mix Scotch but I LOVED it. Both ways even! The Cherry Heering is a find; why did I always think it was some cheap candy type liqueur…it is fabulous! There really aren’t that many cocktails that use Scotch, are there? This one, the Rob Roy (basically a Scotch Manhattan), and the Rusty Nail (I forget what’s in that – Drambuie maybe?) are the only ones I can think of off the top of my head. There are a few more, but very few. One of these days I suppose I need to buy some Scotch just to see what these cocktails are like, but when it comes to sippn’ whiskey I’m more of a rye type. Although maybe I’ll find I’ll enjoy sippin’ Scotch, too (I used to when I was in my 20s, but that’s eons ago). Anyway, really nice post, and great photos, as usual. Thanks. Interesting cocktail. I’m not much of a scotch drinker so we never have the stuff in the house, but I think I know where I can get one, hint, hint. We should have a cocktail party at my house before I move…I have what might be called a plethora of booze. This was so good; I’m sure the fab oranges did not hurt!